Agent May is one of the top Agent of SHIELD. In the episode Self Control May is hinted at being a Hydra sleeper Agent. Is it possible she has fooled everyone all along? 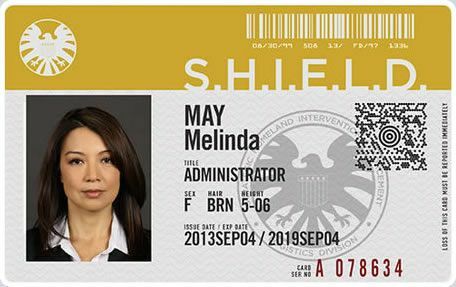 Melinda May has a desk job at SHIELD when confronted by Agent Coulson to be added to his new team. She reluctantly agrees when Coulson says he only wants her to be a pilot. May does not last long only being a pilot. Soon she is show casing advanced martial skill with her only equal is Ward. In the Well episode she is able to hold the berserker staff without side effect because the terrible images brought out by the staff are what she already sees everyday. It is unknown exactly what she means by this. It is likely a reference to a mission gone wrong that other agents refer to. In this mission May responds to a situation where a SHIELD team is being held hostage. She is alone but takes down many adversaries this mission earns her the name of "the Calvary". She hates the name. May had a brief fling with Ward but cut it off when it was revealed his true feeling were for Skye. It is later revealed that May had guided the selection of the team. She was ordered by Nick Fury to watch after Coulson and to put him down if he went insane. This was due to his exposure to the gh 325 serum. In a climatic battle she brutally beats and apprehends Ward after he betrayed the team. She also regains the trust of Coulson by procuring a file that shows he was actually behind the GH project that brought him back to life. The season begins with May and Coulson working to locate a mysterious city whose map has to do with the Kree aliens. May is in charge of monitoring Coulson to make sure that the alien serum in his body does not compromise him. A brain washed SHIELD agent named Agent 33 uses a special mask to take on the appearance of May. She attempts to replace May but Coulson sees through her. In a battle the kidnapped May battles her imposter. Agent 33's mask is damaged in the battle forcing her to keep the damaged and scared visage of Agent May on. Agent May helps lead the team to reconcile with a new group who calls themselves the "Real" SHIELD. She also is forced to confront the event that led to her being called the Calvary in which she was forced to kill an Inhuman child with dangerous powers. May helps bring down the rogue Inhuman group. Agent May begin the season on vacation. Her former husband Andrew becomes the Inhuman Lash. As the bodies pile up around Lash she is eventually forced to confront him. Lash dies in a battle with Hive. Coulson and May seem to be growing close together but as their relationship begins to blossom May is replaced by an android. The android May does not initially know she is an android and is shocked by the discovery. As the the SHIELD base is infiltrated by other LMD androids she turns on her own kind to take down the LMD Coulson. The real May is still being held by the LMD with her mind existing in a perfect artificial world called the framework. In May's perfect world she is standing proudly in a Hydra emblazoned Triskellion. 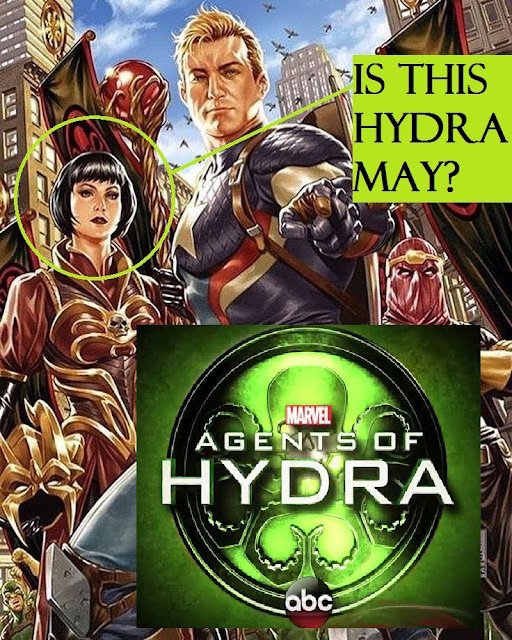 This hints at May having loyalties to Hydra. There is also a character that appears standing next to Steve Rogers in art from Secret Empire. In this story Captain America was inverted by the cosmic cube to have been a long time deep cover agent of Hydra. The person next to him looks like a female version of the Hydra agent Gorgon. I initially assumed this was meant to be Madame Hydra but her face really looks like that of May.